State championship captain reunited with former teammate. NORFOLK, Va. -- The Norfolk Admirals, of the East Coast Hockey League, signed Christian Horn ('12) and the Benilde-St. Margaret's alum paid dividends in his first appearance. Horn was signed on Dec. 21 and, on his first shift, took a pass from former Red Knight teammate, Grant Besse, to score his first Admiral goal just one minute, 17 seconds into Saturday's 3-2 shootout win over the Orlando Solar Bears. The co-captain of BSM's 2012 Class AA state championship team, Horn played 22 games in the ECHL last season with the Rapid City Rush. 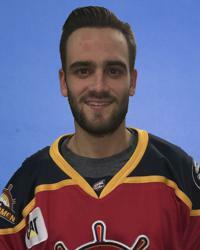 He has also played parts of the the last three seasons in the Southern Professional Hockey League. He came to Norfolk after playing 12 games with Peoria of the SPHL. After completing his Red Knight career as the school's all-time leading scorer, tallying 80 goals and 207 career points, Horn went onto play two seasons at St. Lawrence and is now in his third professional season.